To support the growth of high-impact projects developed by our members, ELN hosts an annual ‘Dragons’ Den’ event called ELNshowcase where members of the ELN pitch their innovative city-building ideas in front of a panel of distinguished judges for a chance to win initial funding, resources and profile. 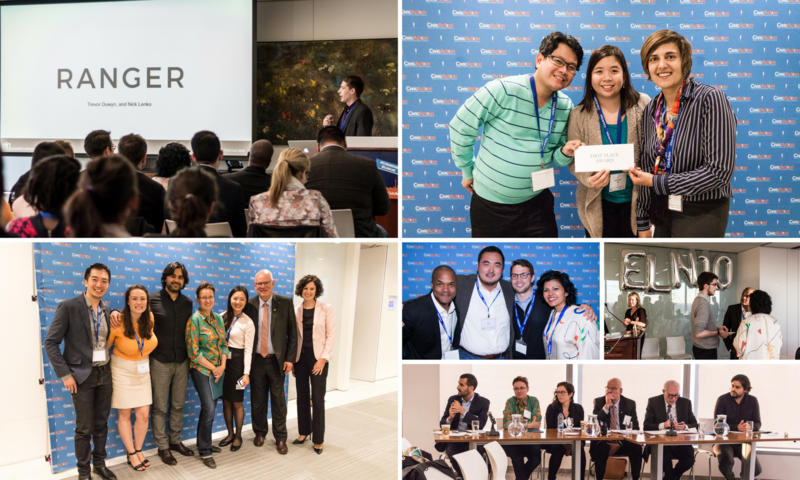 Learn more about some of the past projects pitched by our incredible emerging leaders – hopefully they’ll inspire you to enter the Dragon’s Den yourself! Baby Bucks: Pilot loan program that presents an opportunity for middle-class urban families to invest in the productivity of parents and the cognitive development of their young children at the same time. Get Outside! Toronto Parks + Trails App: An app that showcases our incredible greenspaces AND calls on people to interact with parks and trails in new ways. Wayfinding, accessibility, amenity, event, activity and permit info will be at the user’s fingertips. New Understandings: Concentrate on improving the sexual health of those most in need by sharing knowledge, increasing service access, and strengthening positive sexual attitudes and behaviours. Ranger: A smartphone application designed to make it easier to find Toronto’s parks, and provide a richer experience within them through wayfinding, entertainment, education, and universal access. Tkaronto: A project that will convene stakeholders for dialogue and action toward retrieving Toronto’s indigenous heritage in our public space. Get Outside! Toronto Parks + Trails App took home the grand prize package of $1500, 100 hours of co-working space at the Centre for Social Innovation (CSI), a strategy session with PwC and promotional support from NOW Magazine. Congratulations also to Tkaranto Project and New Understandings (NU) who tied for second place, and to the Baby Bucks project which took home the inaugural People’s Choice Award as voted on by attendees in the room. View pictures from the evening here. United Toronto: For One 6 took the top prize for its ready-to-scale idea that will empower Residents’ Associations across the city to make neighbourhoods more connected and to gather best practices to engage residents. Cultiv8tor pitched their innovative idea for a holistic shared working space that incorporates co-working, childcare and co-learning for parents and children, in an affordable pay-as-you-go flexible model. Project CORE proposed their project to address the issue of priority youth facing barriers by bringing together service providers and their target audiences, Project CORE aims to co-create opportunities and redesign entrepreneurship to meet their needs. cARTe Blanche: A legacy of ART shared their idea to make our public spaces more beautiful and inspiring by saving the most exciting art from Toronto’s Nuit Blanche art festival. By empowering citizens to vote on their favourite pieces, cARTe Blanche will add these pieces to a new collection throughout the city. Missed all the fun? Check out Yonge Street Media’s coverage of the event and photo highlights! Affordable and Low-Income Environmental Renewal in Toronto (ALERT) took home the first prize, and aims to provide a toolkit to support continuous life-cycle environmental improvement in Toronto’s residential high-rises. Teachers Beyond the Classroom (TBC) received the second prize to develop a unique professional network and practice model that will connect new teachers to non-school employment opportunities across the GTA. Aboriginal Youth Media Training Project were selected by Todd Roberts, CIBC, to receive a surprise $1000. The GTA Export Hub shared their unique idea to start a one-stop support shop for Small Medium Enterprises (SMEs) to diversify the GTA’s export market by leveraging the assets and networks of diaspora professionals and existing institutional support. Accessible. People (EAP) proposed to engage employers through an experiential accessibility consulting process to use the talents of highly-skilled individuals with mobile disabilities. Amplifi TO pitched their idea to build an aggregate map and calendar of issue-based events across the City of Toronto, to peer-to-peer conversations that connect organizations and individuals, fueling an issue-based conscience among voters during the 2014 election year.